Another of the towns we can see from the house, high up on the side of the Apennines, is Cortona. 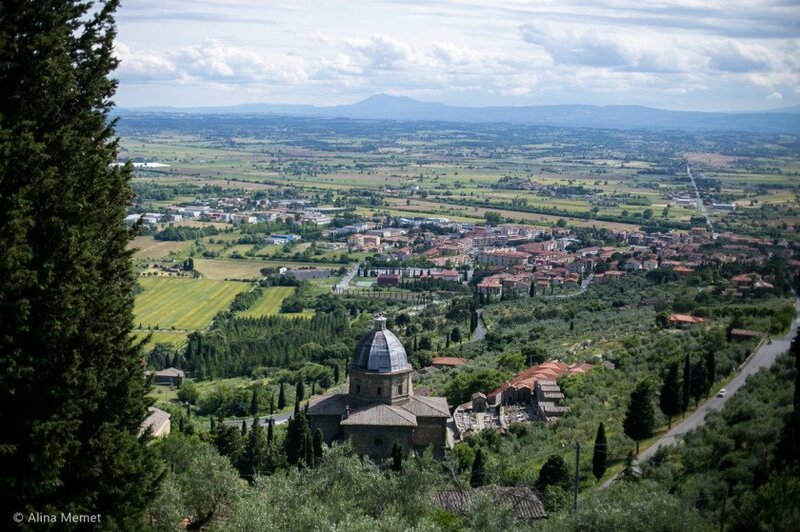 Cortona is the venue of long long views, a great Gelato and our favourite passeggiata by far. Passeggiata = a stroll in town looking good. Typically after dinner. It’s quite a serious business, the chicer the town, the chicer the passeggiata. And Cortona is a very chic spot indeed. 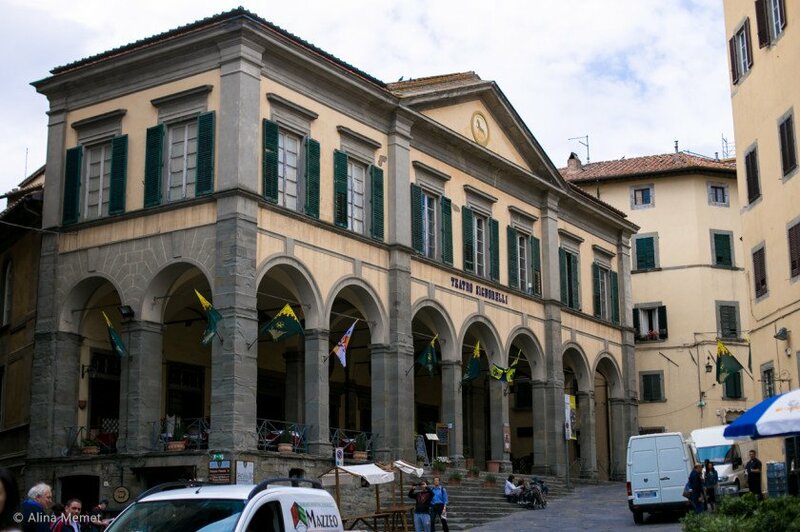 In the province of Arezzo – and with a very different feel to the Sienese towns, the buildings lining Cortona’s elegant streets are more frequently plastered. Featuring more stone and particularly the lovely grey – blue Pietra Serena in their construction as well as endless peeling paint studies in the art of muted greys and aged pastel tones; inspiring for an artistic eye. 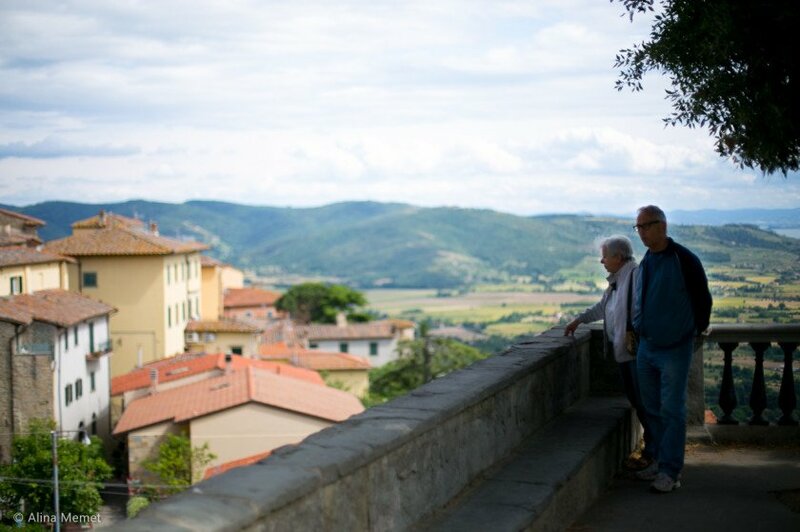 Very photogenic, romantic even on a grey day, a trip to Cortona is recommended to all of our guests – and especially to honeymooners looking for that perfect backdrop for stylish fotoricordi. The ‘ice cream steps’ in Piazza di Repubblica. the Gelateria Snoopy is just around the corner. Yes, you can wear high shoes relatively comfortably here and that’s not true in many of our lovely hill towns… But bring flats for the hike to the top for the long long views…. 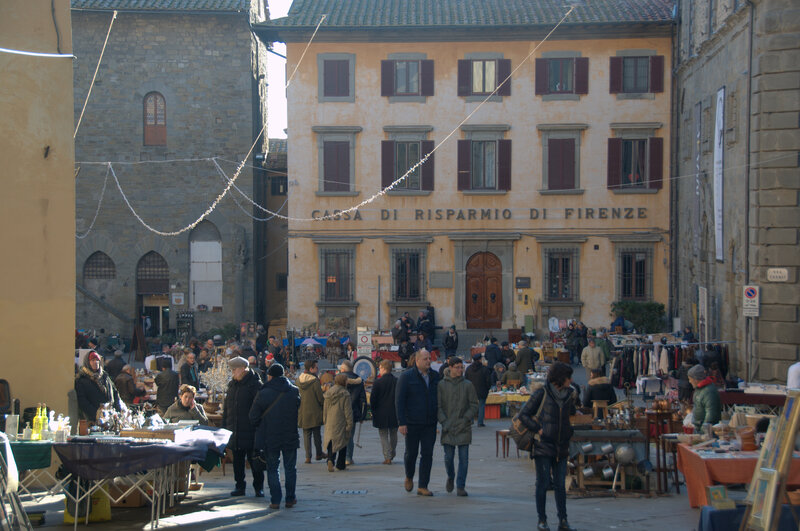 A firm favourite of the American visitor, promoted not only by the ‘Under the Tuscan Sun’ connection, but also by historic connections to the University of Georgia, Cortona has established a reputation as a stylish hill town. Bristling with chic little artisan outlets – fashion, jewellery, leather, a wonderful hat shop, antiques, art, local ceramics, several very good bars, a lovely enoteca and plenty of top notch white tablecloth dining, and a remarkable ice cream shop. 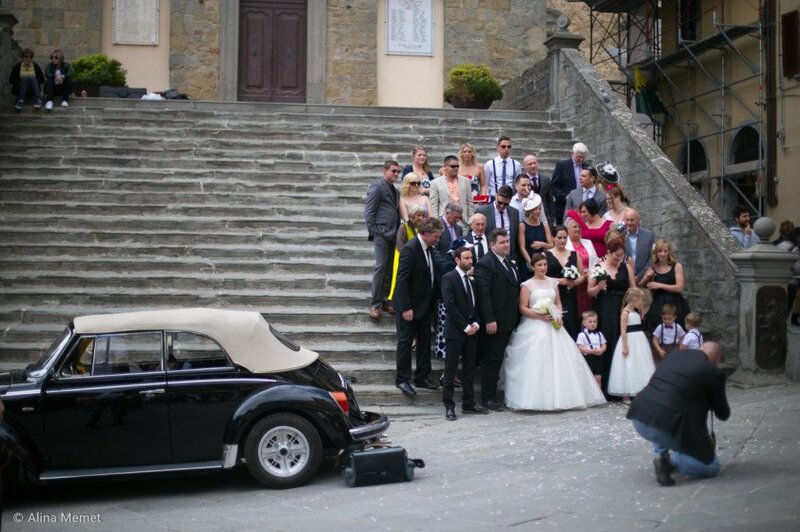 In Cortona the experience is all about atmosphere. Passing an hour or two of on the main street watching the world go by in Cortona is rather lovely. THE DRIVE: 30 minutes from the house PARK just follow the blue ‘P’ signs on the approach, there’s a large car park below the city walls; it’s fairly obvious when you’re close in. The Cortonese have kindly put a pair of elevators to glide you effortlessly up to the centre VISIT any time of day although bear in mind that only restaurants will tend to be open between 13.00 and 16.00… when everyone’s home eating pranzo SPECIAL EVENTS the annual TUSCAN SUN FESTIVAL DON’T MISS the SANTA MARGARITA church (just head up, up, up…) and the long views from the FORTEZZA above it (before sunset) the evening PASSEGGIATA, Ice cream at GELATERIA SNOOPY, ITINERARY a few hours in Cortona combines well with wine tasting in parts of Chianti, a city visit to Arezzo or town visit to Lucignano – as well as being a suitable dinner stop ‘en route’ home following a trip into Umbria. Heading cross country from Cortona to the Mall or the Prada factory outlet is also fairly simple.